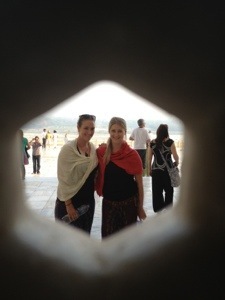 Seriously, what do I say about the Taj Mahal. I don’t know if there are even words in the English Dictionary that can properly describe standing in front of the Taj Mahal as the sun rises. It is beyond words. We woke up at the crack of dawn, met up with our guide Dave and walked the short distance to the Southern entrance. Even the gate was impressive, with its massive arched doorway, beautifully scrawled Arabic inscriptions and sparkling golden domes. Oh my Ganesh! That’s ridiculous. 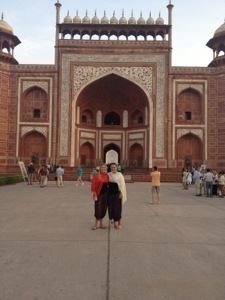 As we passed under the archway and into the Taj Mahal’s beautifully kept garden area, Kelsi and I literally gasped. “Look!” Kelsi grabbed my arm and pointed. 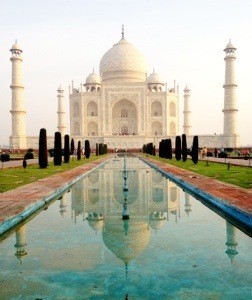 The Taj Mahal stood there, glistening white in the misty morning. It was spectacular. It didn’t look real. It looked like someone had painted this elaborate backdrop and just hung it in the sky. I couldn’t stop staring at it. For the next hour, I honestly couldn’t take my eyes off it. Hands down, the most beautiful man made structure I have ever seen. 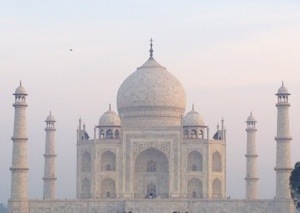 The Taj Mahal also has one of the most beautiful love stories attached to it. 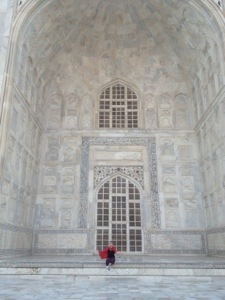 The Emperor Shah Jahan had it built for his third wife, Mumtaz Mahal, after she died giving birth to their 14th child. She was the only wife to bear him any heirs and he loved her with his entire body and soul. Upon her death he vowed to build her a mausoleum unprecedented in elegance, something that would reflect and capture the beauty of the whole world within its walls…and I believe he did. 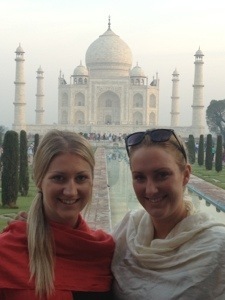 The Taj Mahal, it’s grounds and the two surrounding buildings are entirely symmetrical. The mausoleum itself is symmetrical in four quadrants, so each of the four sides look identical. The only small details that are different are A. The building to the West is a mosque, with an altar facing towards Mecca, whereas the building to the East, although identical in shape, lacks the Mecca-facing altar. And B. When Shah Jahan died, his son had his body placed in a casket next to his beloved wife’s. His casket had to be placed to the side and so is not part of the symmetry. Other than that, every inlaid stone, every tile, every detail in carving and structure is absolutely identical on all sides. No wonder it took so long to build! 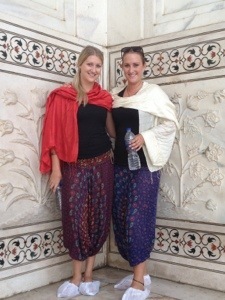 We walked around the mausoleum for about an hour and a half. I could have stayed there all day, gaping in awe. To be honest, I missed most of the facts that Dave rambled on about. To me, it didn’t matter how tall or wide the building was. I just wanted to sit there and take it all in. 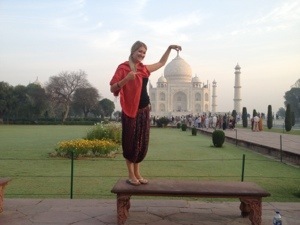 This entry was posted in Asia, India and tagged indi, love, Taj Mahal, Wonder of the World by hilarylust. Bookmark the permalink. 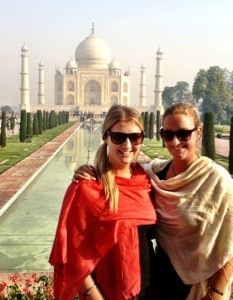 I literally felt the exact same things when I saw the taj mahal for the first time. It didn’t look real – and I couldn’t take my eyes off of it! I lost my breath and immediately choked up when I saw it. It was so beautiful I could have cried. People tried to tell me it was overrated and not worth it, but they were wrong.